Call it a perfect 10-0, this feat of Clay. Just think how well everyone could pitch with three months off in between starts. Clay Buchholz [10-0, 1.61 ERA] Tuesday returned to the mound for the first time since June 8 and displayed no signs of any shoulder issues. Although he was removed after throwing 74 pitches, Buchholz was dealing and found his groove after some uncertainty the first time through the Rays lineup. He was throwing harder and got quicker with his delivery as his night progressed. His closest brush with danger came in the fourth inning. With one out, he walked Matt Joyce on a 3-2 pitch. Then, facing James Loney, he went to a full count before Loney took strike three. Jarrod Saltalamacchia threw a bullet to Stephen Drew, turning that whiff into a strike-em-out-throw-em-out double-play to end the inning and end the Rays' best chance at knocking Buchholz out of the game. Buchholz's final inning may have been his best of the night. He threw just 10 pitches to retire the side in order and notch his sixth strikeout as his curveball snapped with all the wickedness the 27 Rays fans at the Trop Tuesday remembered from his eight-inning, two-hit performance against Tampa Bay in Boston on April 14. Buchholz was finished for the night in time to catch the president's speech on Syria. Of course, the big question remains - When will Alex Rodriguez give up his chemical weapons, namely the PED-aided bat and glove? Buchholz's injury, which may or may not have been caused when he fell asleep holding his daughter [the one who was born in 2010], and his eternal rehabilitation, was a source of frustration and plenty of sarcastic Tweets for Red Sox watchers for the past 93 days. It was foolish to question Buchholz's "manhood" during his longer-than-anticipated absence. The real definition of a man, at least in the very politically-incorrect views expressed here [which are not necessarily the opinions of the Parent Company of This Blog or the magnificent John W. Henry], is someone who takes care of his wife and children. Given this photo, posted following the birth of Buchholz's second child last week, Buchholz appears to be handling that task quite well. Given his good-enough-to-leave-with-the-victory performance against the Rays Tuesday [5 IP, 3H, 0R, 1B, 6K's], those three-months of rest and rehab for that bursitis was time well spent. Buchholz is a significant favorite for the Simulated-Bullpen-Game Cy Young Award, even his numbers aren't substantial enough to qualify him for the one given out in November. Calling him a "wimp" or a "wuss" is counterproductive. It's impossible to say whether he was truly injured or just dealing with too much pain while throwing. And we all know the difference between playing with in an injury and playing through pain. Even Gregory Campbell and his Jupiter-sized nads could only last 50 seconds on a broken leg. Rather, we'll be generous given the Red Sox's fat lead in the A.L. East and label Buchholz as a fine-tuned, complex and a slightly fragile pitching instrument. It might be best if the Red Sox take him to the Fed-Ex/Kinko's in downtown St. Pete and place him in bubble-wrap and peanuts before he flies back to Boston just to be cautious. Buchholz missed the Great Collapse of 2011 thanks to a back injury that ended his season in June after just 14 games. He spent time on the DL in 2008 and missed the first half of the season in 2009 in Pawtucket, which was the year of his lone playoff appearance in Boston. When Buchholz last pitched on June 8, the success the Red Sox enjoyed was still being masked by the aftermath of the Boston Marathon bombing [Remembering "America Strong" on 9/11], the devolution of the Celtics and the Bruins improbable playoff run. The Red Sox, 38-25 at that time, held a 1 1/2-game lead in the A.L. East. But even then, the Bruins had already grown tired of babysitting Tyler Seguin. When Buchholz returned, the Red Sox were 87-58. They held the best record in the American League, extended their lead to 7 1/2-games lead in the A.L. East and pushed their odds of making the playoffs to 100 percent, depending on how your math. In other words, "you were hardly missed, son." Now, after one night with him back, they're 8 1/2 games up on the Rays in the A.L. East with just 16 games to play. As we reported earlier this month, this whole A.L. East is pretty much a done deal now. And this is a jinx-free zone. It was the run the Red Sox enjoyed during Buchholz's absence that allowed them to turn Tuesday night's game into a spring training start, where manager John Farrell had limited his outing to "75-85" pitches before the game began. The return of Buchholz is no different than if the Red Sox had acquired a veteran starter who was used to pitching under the pressure of being in a city like Boston. It's hard to argue his prolonged absence hurt the Red Sox on the standings. 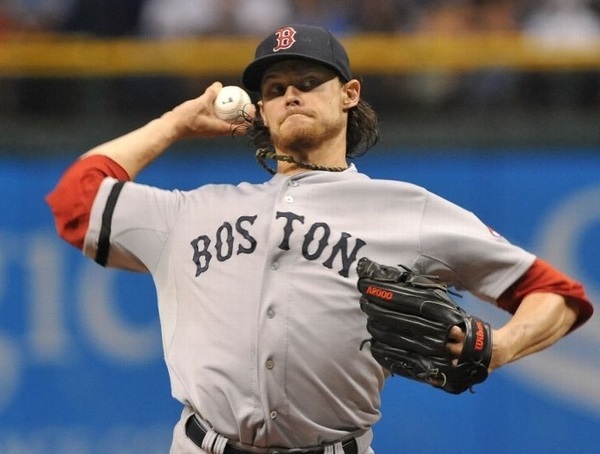 But Buchholz's uncertain status and absence from the rotation was a major factor in the Red Sox acquiring Jake Peavy. Some fans, media types and talk show hosts found fault in that deal because giving up Jose Iglesias should have provided an undisputed number-one starter in return. Given the reality faced by the Red Sox at the time, the Peavy deal was a necessary move for the team to make in order to have a shot at assembling a postseason rotation. The Peavy deal may cause some angst for the Red Sox in 2017, given that he'll be long gone but Iglesias will still be tearing it up for the Tigers at shortstop. But he was acquired to help the team win [at least one] playoff games in 2013. The last time the Red Sox won a playoff game, Heath Ledger was terrorizing movie-goers as the Joker, John Kerry and Ted Kennedy represented Massachusetts in the U.S. Senate and the the first iPad was still 18 months away from being sold. Sometimes, the future is now. If Buchholz can replicate and build upon his performance from Tuesday, the big question becomes which pitchers do the Red Sox decide to use in their three-or-four-man postseason rotation? The Red Sox having too much starting pitching for the playoffs? Sounds like a perfect problem to me. Don't forget to visit our Obnoxious Boston Fan blog. As always, let us know what you think. Post your thoughts here, on our Obnoxious Boston Fan Facebook page, on Twitter @realOBF or e-mail me at obnoxiousbost onfan@hotmail.com.